It is multi user operating system or multi tasking operating system that is no. of operations can be implemented at the same time or user can give number of commands at a time. It is GUI (graphical user interface) based operating system. That is user can interact with the system through some graphical steps. It is user friendly operating system that is every one can work with the system very easily. Networking concepts are possible by using this operating system. Ms-windows consists windows, desktop, all possible colors, pictures etc. A desktop contains icons, task-bar, backgrounds (wallpapers) etc. 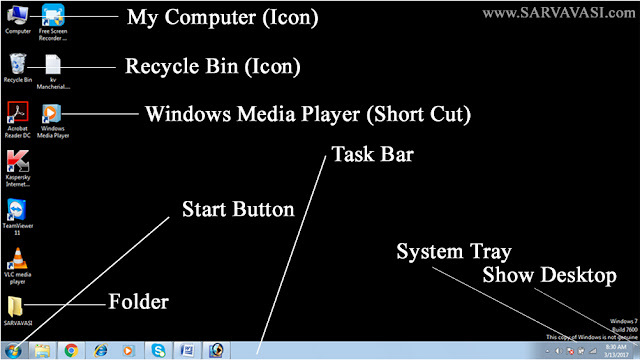 In the graphical user interface (GUI) for a computer operating system or application, a taskbar is a visual device on the desktop that typically shows the user which applications (tasks) are currently active and running. Some taskbars, such as those in Windows operating systems, also include icons for commonly-used utilities such as the system clock and antivirus software. In some systems, the user is allowed to modify the contents, location, or appearance of the taskbar. The system tray (or "systray") is a section of the taskbars in the Microsoft Windows desktop user interface that is used to display the clock and the icons of certain programs so that a user is continually reminded that they are there and can easily click one of them. My Computer is a section of Microsoft Windows first found in Windows 95 and included with all later versions that allows you to explore and manage the contents of your computer drives. The picture to the right shows examples of the My Computer icon in Microsoft Windows XP, Vista and Windows 7, as well as the "This PC" icon in Windows 8 and in Windows 10. Although the name has changed, "This PC" still has the same functionality as "My Computer". My Documents is the commonly recognized name of a special folder in Microsoft Windows, allocated to help users store their personal data files. The actual name of the folder might be different, depending on the version or language of the installed copy of Windows. In Windows XP, it contained other subfolders such as "My Pictures", "My Music" and "My Videos". Starting with Windows Vista, these subfolders were moved out of My Documents and were made its siblings. The Recycle Bin is a folder with a fancy icon where files and folders that you have deleted are stored. They have not been permanently removed from your hard drive(s), they were only moved to this special folder. A folder is a virtual location where programs, files, and other folders can be located. GUI operating system have folders to help users store and organize their files and are accessed using a File Manager.